Cruise and Maritime Voyages (CMV) today announced the first-ever cruise sailing from Puerto Peñasco – Rocky Point on the 550-guest Astoria. The exciting news offers travelers an authentic and memorable way to explore the splendid Sea of Cortez with the introduction of its new 12-day soft expedition cruise program that is part of CMV’s new “Voyages of Exploration” collection, the company said. CMV’s Treasures of the Sea of Cortez will sail round-trip from Puerto Peñasco to distinctive ports of call in Sonora, Sinaloa, and Baja California Sur including: Puerto Topolobampo, Mazatlan, Cabo San Lucas, La Paz, Loreto, Santa Rosalia, and Guaymas. The itinerary also offers Arizonians the unique opportunity to embark on a cruise from their closest sailing port, located just a few hours drive from Phoenix and Tucson. “This is an exciting project that we have been very much looking forward to announcing together with the Mexican states of Baja California Sur and Sonora and the state of Arizona – the first opportunity to cruise from Puerto Peñasco – Rocky Point! Our new Treasures of the Sea of Cortez voyage takes travelers to discover some of the best kept secret destinations of Mexico from a beautiful seaside town conveniently located just outside Arizona,” said John Dennis, VP, Sales and Marketing for CMV USA. Structured as an “inclusive” cruise, Treasures of the Sea of Cortez includes the cruise program and accommodations category selected, all shipboard gratuities, immersive and enriching lecture series throughout the cruise and house beer and wine included with lunches and dinner onboard. I have been on many cruises and this ship looks like something from the 80's. I guess its a start. How about the 40's. I think it first sailed in 1946?? It sank the Andrea Doria in 1956. It was the MS Stockholm originally in 1946, Vern is correct. Cabins are small compared to newer cruise ships. It’s the oldest cruise ship in the world, but what the hell, I like antiques! They must have had some kind of bilge pumps! (10:28 a.m. EDT) -- Los Angeles has Long Beach, and Houston has Galveston. Now Phoenix and Tucson have an embarkation port to call their own: Puerto Penasco. Never heard of it? Welcome to the club. But at a press conference during Seatrade Cruise Global, the cruise industry's annual event in Miami, British cruise line Cruise & Maritime Voyages shared how they hope to change that. Also known as Rocky Point, the Mexican town is located at the top of the Gulf of California, 60 miles south of the U.S. border and about 200 miles by car from Phoenix and Tucson. It has long had a following among "Zonies," who head to the town for inexpensive seaside margaritas and cervezas. Next winter, Cruise & Maritime Voyages will put Puerto Penasco on the map for small-ship cruises through the Sea of Cortez. The cruise line will offer six identical 11-night itineraries out of Puerto Penasco starting December 7, 2019, visiting destinations on both sides of the Gulf, including Topolobampo, Mazatlan, Cabo San Lucas, La Paz, Loreto, Santa Rosalia and Guaymas. "This is an exciting project that we have been looking forward to announcing together with the Mexican states of Baja California Sur, Sinaloa and Sonora, and the state of Arizona," explained John Dennis, vice president of sales and marketing for Cruise & Maritime Voyages USA. Dennis says all four states have been instrumental in making the cruises happen. 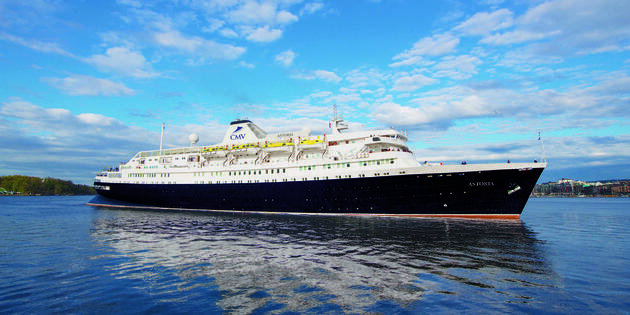 The itineraries will be conducted aboard Astoria, an older 550-passenger vessel that normally spends most of the year sailing the British Isles and Northern Europe. Astoria is not a luxury ship, and although half of the ports (including Puerto Penasco) will be accessed by tender, Dennis was careful not to classify the Sea of Cortez cruises as a pure expedition experience. "We're not heavily expedition oriented, and the cruises target travelers age 55-plus," he explained. "It's a soft expedition and immersion program, and the ship has everything you would expect from a large cruise ship as far as amenities. You've got your spa, salon, casino, and lecture series, and the cabins are a good size." Astoria's Sea of Cortez cruises are semi-inclusive, with gratuities included, along with beer and wine at meals; no children are allowed. The line's typical clientele is predominantly British, but Dennis says he is expecting the Sea of Cortez itineraries to draw 65 to 70 percent of its passengers from Arizona, supplemented by a British contingent, who can now reach Phoenix on two daily flights. Bookings for the cruises opened in the UK in January, and more than 10 percent of the cabins have been sold, according to Dennis. Rates start at $1,599 per person. Since there are no scheduled commercial flights into Puerto Penasco, coach transfers will be available from both Phoenix and Tucson, and the line is working with customs officials to expedite border crossings. Of particular interest to Mexico fans will be calls on Topolobampo, the western gateway to the famed Copper Canyon railway. The port has been off the calendar for most cruise lines for much of the last few years, although Holland America's Maasdam will be making two calls in April 2020. Astoria will arrive in Topolobampo at 5 a.m. and stay in port until midnight, allowing passengers ample time to take in the full Copper Canyon rail experience.